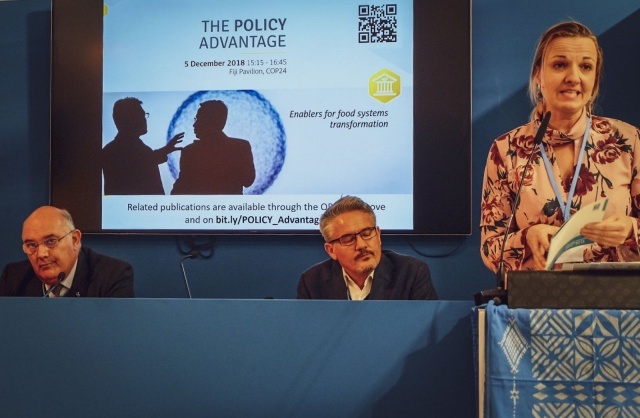 The idea that policy change is necessary for a lasting transformation of food systems under climate change was the foundation of the second event of the Agriculture Advantage 2.0 event series at COP24, The Policy Advantage: Enabling a food systems transformation. This policy change will need to go beyond agriculture alone, covering issues such as land rights, dietary guidelines and market regulations. In line with this, connecting actors from diverse backgrounds will be necessary for developing robust policies and incentives across relevant sectors that can enable a transformation of food systems. Thus the event brought together participants from a diverse set of backgrounds, with presentations and discussions on topics spanning South African policy change, water management using renewable energy, agricultural policy making inside the UNFCC, and the perspective of farmers on the necessary policy changes. Panellist Julia Wolf (Natural Resources Officer, Climate Change Adaptation, FAO) connected the policy discussion to the UN negotiations currently taking place at the COP, national actions on climate change and adaptation planning. FAO and UNDP have jointly started a program to integrate agriculture into national adaptation plans, wherein FAO focuses on the agriculture side and UNDP on the governance side of adaptation. In order to achieve this integration, policy makers need to think about the policy nexus around each specific challenge. For instance, in an FAO project in Uruguay, the inclusion of gender aspects in a reporting questionnaire helped the project to understand the needs of important local beneficiaries: women-headed rural farming households. South Africa provides a concrete example of the need to integrate agriculture into policy. Highly dependent on agriculture, any type of policy planning in South Africa needs to be done with agriculture in mind. And as climate change will impact every sector, there are a few things that keynote speaker that Vitumbiko Chinoko of CARE Climate Change suggested need to be done differently. Firstly, the mandate around agriculture in South Africa still focuses on increasing production and resilience. Emissions reductions are not yet high on the agenda. Secondly, while discussions about food shortages are plentiful, dialogue on food waste is lacking. But as 40% of food is wasted, the region experiences avoidable economic losses and greenhouse gas (GHG) emissions. Thirdly, both NGOs and public policy have focused on production for its own sake. There is a need to shift towards producing with value in mind. The policy advantage is also clear in the case of a project in northern India, where groundwater tables are dropping and GHG emissions are generated from groundwater extraction due to subsidies for extraction projects that were developed with the objective of ensuring food security. While it is crucial to maintain a secure supply of food, the trade-offs between groundwater extraction, energy use, food security and climate change create a “wicked” problem. In response to this challenge, IWMI co-developed the Solar Power as a ‘Remunerative Crop’ (SPaRC) project, panellist Alan Nicol of IWMI explained. The project aims to transforms farmers from consumers of energy to producers of energy through the use of on-farm solar panels for irrigation, creating a power win-win. As the farmers gain independence from the grid they also generate additional economic value—experience shows they can sell 75% of the energy they produce back to the grid. Now the project is looking to expand this successful model to Africa. Such experiences show that policies not only need to create enabling environments focusing for sustainable resource use, but can also foster economic incentives, guiding markets in a climate-friendly and resilience-building direction. Farmers are an undeniably important part of the policy picture. As the most vulnerable group when it comes to the impacts of climate change, they are key beneficiaries of policy change; as the producers of food, they are also implementers of change. Theo De Jager (World Farmers’ Organization) explains that this was the impetus behind the launch that same day of the The Climakers: Farmers Driven Climate Change Agenda. The initiative aims to develop a climate change agenda driven by farmers and spur formation of the partnerships that are needed to transform the agriculture sector. Una May Gordon (Government of Jamaica), moderator for the session, pointed out that another important stakeholder group was missing from the conversation: women. From international to national to local and stakeholder-specific, the different perspectives presented at the Policy Advantage event paint a picture of the need for policy change and a way forward that will ensure environmental sustainability and equity. CCAFS journal article: Reducing greenhouse gas emissions in agriculture without compromising food security?